Something caught my eye on twitter the other day. We follow quite a few suppliers on twitter, some we have used, other that we haven't but hope to use one day. WoodBlocX is one of them. I absolutely love the idea of their products and they always look such good quality. 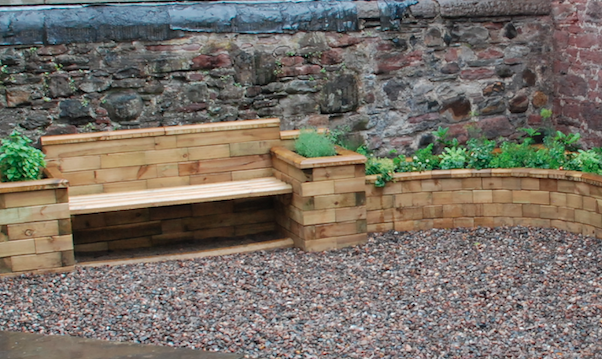 We construct a lot of raised beds and planters from softwood sleepers. But the look of the WoodBlocX is very neat and clean and I would love to incorporate it in a design one day. On their website they show you examples of bespoke raised beds and how much the cost would be to make them in that design- this is really good for the client as they can price up how much they think their design would cost by looking at other similar designs. Or alternatively you can buy a pre-made design. I have been reading through the section "Why Choose' on their website and it highlights all the reasons why WoodBlocX are a good choose. There are lots of ideas on how they can be used for a retaining wall, raised bed, ponds or even decked areas. Looking forward to using them on a project one day. In the meantime, here is another photo with some inspiration of how you could use WoodBlocX.